An Israeli bank says it is to launch a credit card that cannot be used on the Sabbath - the Jewish day of rest. Bank Leumi, one of Israel's biggest banks, said it was developing the card in response to requests from the observant Jewish community. 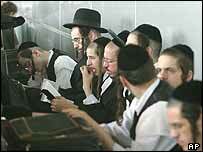 Religious leaders say that hundreds of thousands of ultra-Orthodox Jews do not currently own a credit card. Strict Jews refuse to drive cars, use electricity or operate telephones during the Sabbath. "It's an initiative that started among religious people," Bank Leumi PR officer Guy Keider said. He said the bank was still developing the card, to be handled by Visa and Mastercard, and did not yet have a launch date. The ultra-Orthodox group behind the initiative is reported to include Rabbi Rafael Halperin, owner of a chain of opticians which observes the Sabbath, and MK (member of the Knesset) Meir Porush. The card will not operate on the Sabbath - which runs from sundown on Friday until an hour after sundown on Saturday. Reports also say it may not work on any day in shops which do not honour the Sabbath. A significant minority of Israelis are observant Jews. Mr Keider said the bank estimated the market for the new card was worth 10 million shekels ($2.3m) a month.